Abraham Lincoln wasn't born in a log cabin in Kentucky. At least that's what some folks in Rutherford County believe. They are convinced the 16th president was born near the small North Carolina town of Bostic. As the story goes, his mother had an affair with a gangly, 6-foot tall, prominent businessman named Abraham Enloe, then fled in shame to Kentucky with the baby. Playwright Ludy Wilkie has donated over twenty years of research material on legends that Abraham Lincoln was born in North Carolina to the Bostic Lincoln Center. Wilkie has written two plays about the folktale. Abe Lincoln of Rutherford County was produced by the Rutherford County Arts Council readers theatre in 1987. Congressman James McClure Clarke attended a performance and praised it. The Ballad of Nancy Hanks was performed by the Rutherford Community Theatre in 2005 and 2012. Historian Jerry Goodnight attended the 2005 production and mentioned it in his book, Looking for Lincoln. and one has articles saying Abraham Lincoln was the son of Adam Springs of Gaston County. The final packet deals with press materials about his plays and permission to quote various sources. Sunshine Elementary students and principal Neil Higgins view the documentary "Honest Abe." 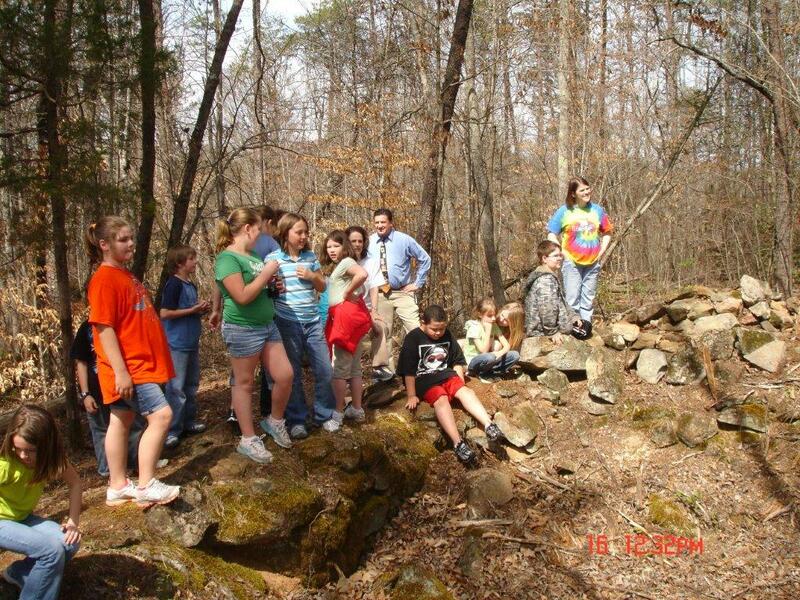 Sunshine School students, Principal Neil Higgins and teacher Paula Davis tour Lincoln Hill after a visit to the museum, October 2012. On April 3, 2009, Keith Price (President), Lydia Clontz (Vice-President) and Louise Layton (Secretary) participated in the NPR-sponsored StoryCorps effort and recorded the story of the Bostic Lincoln Center, Inc. This recording, along with thousands of others, will be maintained by the Library of Congress in Washington, D.C. Find out more details about StoryCorps by using this link to the StoryCorps website. See the February 2009 issue of WNC (Western North Carolina Magazine) for another article featuring the Bostic Lincoln Center, Inc. The February 2009 issue of Our State magazine, features the Bostic Lincoln Center in a story entitled, "The Museum Doubt Built," by Charles Blackburn, Jr.
Carolina Banker, the publication of the NC Bankers Association, features the Bostic Lincoln Center as the cover story and feature article [PDF] of its Summer 2008 edition. Three former U.S. Presidents - James K. Polk, Andrew Jackson, Andrew Johnson - were born in North Carolina. However, thanks to the efforts of The Bostic Lincoln Center (BLC) in Bostic, NC, it may be proven there was a fourth president with N.C. roots - Abraham Lincoln. An article on the BLC dedication and grand opening in the News & Observer (Raleigh, NC) may be found here. An audio slideshow produced by the News & Observer may be viewed here. An article from the Charlotte (NC) Observer is here. An article from the Shelby (NC) Star may be viewed here. An article from the Statesville (NC) Record & Landmark article is here. An article from the Fort Wayne (IN) Journal-Gazette is here. For more than fifty years, Tom was the primary influence keeping alive the local tradition of Abraham Lincoln's Rutherford County birth, and provided the inspiration for the Bostic Lincoln Center. He was an Emeritus Board Member of the Bostic Lincoln Center and a revered authority on Lincoln's Carolina origins. Save The Date! The Bostic Lincoln Center museum dedication is April 12th, 2008! The BLC thanks the Bostic Town Council and Mayor Mitch Harrill for generously providing the historic building. Currently being renovated, the building is a former Bostic town hall and fire station. 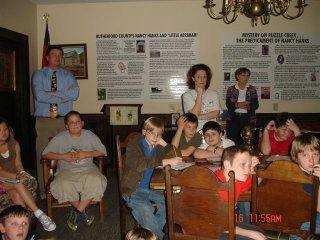 The Bostic Lincoln Center co-sponsored a presentation at Lanier Library in Tryon, NC, on February 19, 2008. Speakers included BLC officers and Jerry Goodnight (co-author of The Tarheel Lincoln). New photographs of Abraham Lincoln's second inaugural have been discovered. New photographs of Abraham Lincoln arriving at the stage to deliver his Gettysburg Address have been discovered. The Bostic Lincoln Center organized a Lincoln Origins Forum in Forest City, NC, on April 14, 2007. The Tarheel Lincoln co-author Jerry Goodnight visited Rutherford County in May 2006 to address the Bostic Lincoln Center at the Bostic Town Hall. Testing of Lincoln's living relatives suggest that Abraham Lincoln may have suffered from ataxia (The Arizona Republic, Feb 12 2006). An Associated Press story in the Chicago Sun-Times mentioned the question, including Eller & Goodnight's The Tarheel Lincoln, in February 2005, in an article about Presidential birthplaces. Carolina Country has had a series of articles on the question of Lincoln's Bostic birth. and again in February 2004. The most recent installment is from February 2006. An Associated Press article from December 2003: "Book suggests Lincoln was born in N.C. - and out of wedlock". Genealogy Today has some further information, including a dedicated webpage on the topic and detailed report by R. Vincent Enlow (PDF file). Cherry Bounce Trail has a map of the area around Lincoln's traditional birthplace.